In Egypt, Algeria, and Morocco. A journey which is made to a shrine or sacred place in performance of a vow or for the sake of obtaining some form of divine blessing. Every male Israelite was required to visit the Temple three times a year (Ex. xxiii. 17; Deut. xvi. 16). The pilgrimage to Jerusalem on one of the three festivals of Passover, Shabu'ot, and Sukkot was called "re'iyah" (= "the appearance"). The Mishnah says, "All are under obligation, to appear, except minors, women, the blind, the lame, the aged, and one who is ill physically or mentally." A minor in this case is defined as one who is too young to be taken by his father to Jerusalem. According to the Mosaic law every one should take an offering, though the value thereof is not fixed (comp. Ex. xxxiii. 14; Deut. xvi. 17); the Mishnah, however, fixed the minimum at three silver pieces, each of thirty-two grains of fine silver (Ḥag. i. 1, 2). While the appearance of women and infant males was not obligatory, they usually accompanied their husbands and fathers, as in all public gatherings (Deut. xxxi. 12). The Talmud plainly infers that both daughters and sons joined the pilgrims at the Passover festival in Jerusalem (Pes. 89a; Giṭ. 25a). According to the Biblical accounts, Jeroboam, who caused the secession of Ephraim from Judah, made two calves of gold, placing one in Dan and the other in Beth-el, to divert the pilgrims from Jerusalem (I Kings xii. 26-33). He stationed guards on the boundary-lines of his dominions to prevent the festival pilgrimages to the Temple (Ta'an. 28a). So-great a menace to the Ephraimite government were the Temple pilgrimages that even King Jehu, who destroyed the Ba'al, feared to remove the golden calves of Jeroboam (II Kings x. 28, 29). 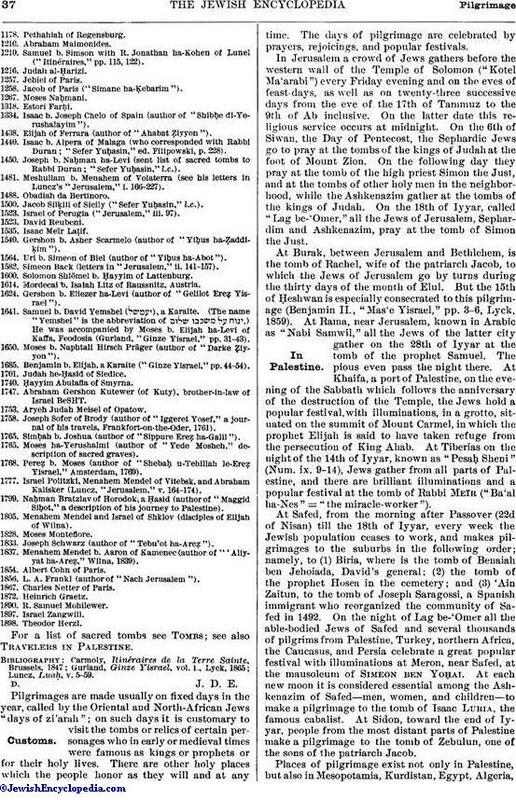 In Judea the pilgrimages to Jerusalem were kept up regularly, but the principal gathering of the people was on the Sukkot festival, called "Ḥag ha-Asif" = "Festival of Gathering" (I Kings viii. 65; II Chron. vii. 8, 9). 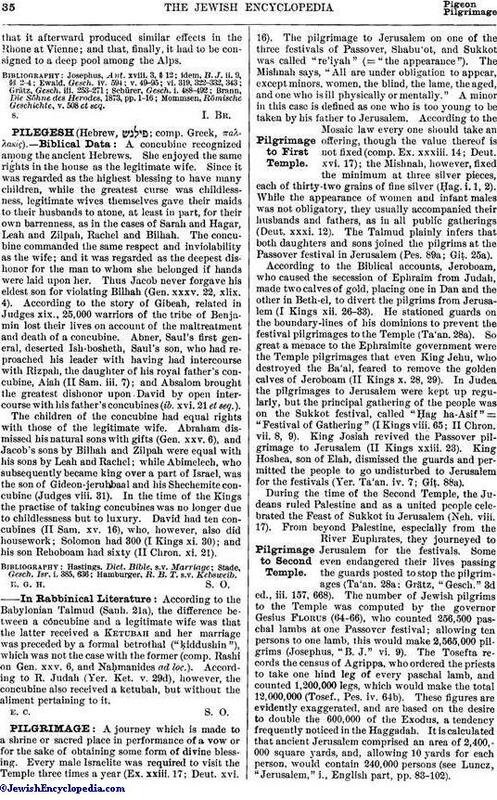 King Josiah revived the Passover pilgrimage to Jerusalem (II Kings xxiii. 23). King Hoshea, son of Elah, dismissed the guards and permitted the people to go undisturbed to Jerusalem for the festivals (Yer. Ta'an. iv. 7; Giṭ. 88a). During the time of the Second Temple, the Judeans ruled Palestine and as a united people celebrated the Feast of Sukkot in Jerusalem (Neh. viii. 17). From beyond Palestine, especially from the River Euphrates, they journeyed to Jerusalem for the festivals. Some even endangered their lives passing the guards posted to stop the pilgrimages (Ta'an. 28a; Grätz, "Gesch." 3d ed., iii. 157, 668). The number of Jewish pilgrims to the Temple was computed by the governor Gesius Florus (64-66), who counted 256,500 paschal lambs at one Passover festival; allowing ten persons to one lamb, this would make 2,565,000 pilgrims (Josephus, "B. J." vi. 9). The Tosefta records the census of Agrippa, who ordered the priests to take one hind leg of every paschal lamb, and counted 1,200,000 legs, which would make the total 12,000,000, (Tosef., Pes. iv. 64b). These figures are evidently exaggerated, and are based on the desire to double the 600,000 of the Exodus, a tendency frequently noticed in the Haggadah. It is calculated that ancient Jerusalem comprised an area of 2,400,000 square yards, and, allowing 10 yards for each person, would contain 240,000 persons (see Luncz, "Jerusalem," i, English part, pp. 83-102). The facilities provided for the convenience of the pilgrims were such as to encourage pilgrimages. Special measures were taken to repair the roads leading to Jerusalem and to dig wells along the route (Sheḳ. i. 1, v. 1). Thirty days before the festival it was forbidden to engage professional mourners to bewail the dead lest they get their compensation from the money intended to be spent in Jerusalem (M. Ḳ. viii. 1). The hides of the sacrifices were left to compensate the innkeepers for lodging the pilgrims, and no other fee was allowed (Yoma 12a). The inhabitants of Jerusalem received the pilgrims hospitably; the priests permitted them to see the showbread and told them of the miracle connected with it (Yoma 21b). Public speakers praised and thanked the pilgrims (Suk. 49b; Pes. 5b). The ceremony attending the offering of the first-fruits (see Bikkurim) in Jerusalem (Deut. xxvi. 2-4), which commenced on Shabu'ot (the Feast of Harvest; comp. Ex. xxiii. 16), is supposed to give a general idea of the reception accorded to the pilgrims. The pilgrimages to Jerusalem did not cease with the destruction of the Temple (Cant. R. iv. 2). The women often joined their husbands, sometimes in spite of the protests of the latter (Ned. 23a). But the joy that attended the former pilgrimages, when the Temple was still in existence, changed to lamentations for the loss of national and political independence. The pilgrims mourned the destruction of the Temple and cried: "Thy holy cities are now in ruins; Zion is a wilderness; Jerusalem is a desolation. Our Sanctuary, the pride of our ancestors, is burned down, and all our precious things are destroyed" (M.Ḳ. 26a). The Karaites in the ninth century, likewise showed great devotion to Jerusalem. Their ḥakam, Sahl ibn Maẓliaḥ, wrote to Jacob b. Samuel that Karaite pilgrims of various towns gathered to pray for the restoration of Zion; these pilgrims he described as Nazarites who abstained from wine and meat (Pinsker, "Liḳḳuṭe Ḳadmoniyyot," Appendix, p. 31). A company of Karaites, headed by Moses ha-Yerushalmi, journeyed from Chufut-Kale ("The Jewish Rock"), from the Crimea, and from the Caucasus. The inscription on Moses' tombstone, dated 4762 (1002), reads: "Good luck followed him and his companions to the tomb of King David and of his son Solomon, which no other persons heretofore had been permitted to enter." All pilgrims to Palestine were sent out with music and song in honor and praise of the Holy Land. 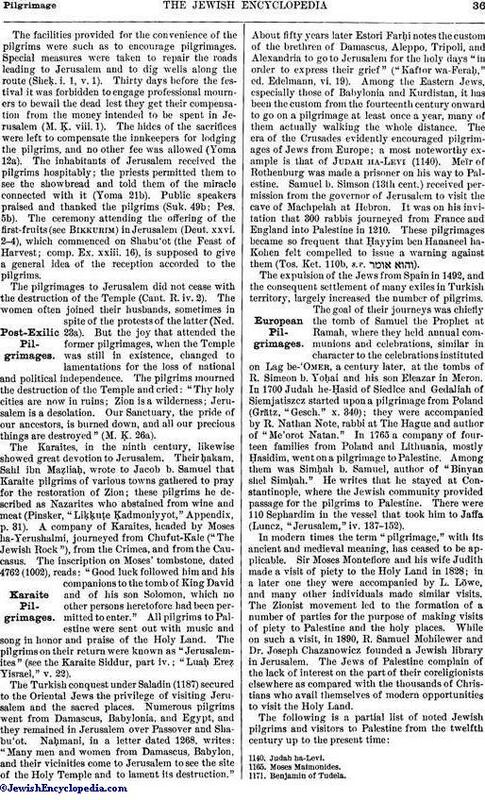 The pilgrims on their return were known as "Jerusalemites" (see the Karaite Siddur, part iv. ; "Luaḥ Ereẓ Yisrael," v. 22). The Turkish conquest under Saladin (1187) secured to the Oriental Jews the privilege of visiting Jerusalem and the sacred places. Numerous pilgrims went from Damascus, Babylonia, and Egypt, and they remained in Jerusalem over Passover and Shabu'ot. Naḥmani, in a letter dated 1268, writes: "Many men and women from Damascus, Babylon, and their vicinities come to Jerusalem to see the site of the Holy Temple and to lament its destruction." About fifty years later Estori Farḥi notes the custom of the brethren of Damascus, Aleppo, Tripoli, and Alexandria to go to Jerusalem for the holy days "in order to express their grief" ("Kaftor wa-Feraḥ," ed. Edelmann, vi. 19). Among the Eastern Jews, especially those of Babylonia and Kurdistan, it has been the custom from the fourteenth century onward to go on a pilgrimage at least once a year, many of them actually walking the whole distance. The era of the Crusades evidently encouraged pilgrimages of Jews from Europe; a most noteworthy example is that of Judah ha-Levi (1140). Meïr of Rothenburg was made a prisoner on his way to Pal estine. Samuel b. Simson (13th cent.) received permission from the governor of Jerusalem to visit the cave of Machpelah at Hebron. It was on his invitation that 300 rabbis journeyed from France and England into Palestine in 1210. These pilgrimages became so frequent that Ḥayyim ben Hananeel ha-Kohen felt compelled to issue a warning against them (Tos. Ket. 110b, s.v. ). The expulsion of the Jews from Spain in 1492, and the consequent settlement of many exiles in Turkish territory, largely increased the number of pilgrims. The goal of their journeys was chiefly the tomb of Samuel the Prophet at Ramah, where they held annual communions and celebrations, similar in character to the celebrations instituted on Lag be-'Omer, a century later, at the tombs of R. Simeon b. Yoḥai and his son Eleazar in Meron. In 1700 Judah he-Ḥasid of Siedlce and Gedaliah of Siemjatiszcz started upon a pilgrimage from Poland (Grätz, "Gesch." x. 340); they were accompanied by R. Nathan Note, rabbi at The Hague and author of "Me' orot Natan." In 1765 a company of fourteen families from Poland and Lithuania, mostly Ḥasidim, went on a pilgrimage to Palestine. Among them was Simḥah b. Samuel, author of "Binyan shel Simḥah." He writes that he stayed at Constantinople. where the Jewish community provided passage for the pilgrims to Palestine. There were 110 Sephardim in the vessel that took him to Jaffa (Luncz, "Jerusalem," iv. 137-152). In modern times the term "pilgrimage," with its ancient and medieval meaning, has ceased to be applicable. Sir Moses Montefiore and his wife Judith made a visit of piety to the Holy Land in 1828; in a later one they were accompanied by L. Löwe, and many other individuals made similar visits. The Zionist movement led to the formation of a number of parties for the purpose of making visits of piety to Palestine and the holy places. while on such a visit, in 1890, R. Samuel Mohilewer and Dr. Joseph Chazanowicz founded a Jewish library in Jerusalem. The Jews of Palestine complain of the lack of interest on the part of their coreligionists elsewhere as compared with the thousands of Christians who avail themselves of modern opportunities to visit the Holy Land. 1210. Samuel b. Simson with R. Jonathan ha-Kohen of Lunel ("Itinéraires," pp. 115, 122). 1258. Jacob of Paris ("Simane ha-Ḳebarim"). 1334. Isaac b. Joseph Chelo of Spain (author of "Shibḥe di-Yerushalayim"). 1438. Elijah of Ferrara, (author of "Ahabat Ẓiyyon"). 1440. Isaac b. Alpera of Malaga (who corresponded with Rabbi Duran; "Sefer Yuḥasin," ed. Filipowski. p. 228). 1450. Joseph b. Naḥman ha-Levi (sent list of sacred tombs to Rabbi Duran; "Sefer Yuḥasin," l.c.). 1481. Meshullam b. Menahem of Volaterra, (see his letters in Luncz's "Jerusalem," i. 166-227). 1500. Jacob Silḳili of Sicily "Sefer Yuḥasin," l.c.). 1523. Israel of Perugia ("Jerusalem," iii. 97). 1540. Gershon b. Asher Scarmelo (author of "Yiḥus ha-Ẓaddi-ḳim"). 1564. Uri b. Simeon of Biel (author of "Yiḥus ha-Abot"). 1582. Simeon Back (letters in "Jerusalem," ii. 141-157). 1600. Solomon Shlömel b. Ḥayyim of Lattenburg. 1614. Mordecai b. Isaiah Litz of Raussnitz, Austria. 1624. Gershon b. Eliezer ha-Levi (author of "Gelilot Ereẓ Yisrael"). 1641. Samuel b. David Yemshel ( ), a Karaite. (The name "Yemshel" is the abbreviation of .) He was accompanied by Moses b. Elijah ha-Levi of Kaffa, Feodosia (Gurland, "Ginze Yisrael," pp. 31-43). 1650. Moses b. Naphtali Hirsch Präger (author of "Darke Ẓiyyon"). 1685. Benjamin b. Elijah, a Karaite ("Ginze Yisrael," pp. 44-54. 1701. Judah he-Ḥasid of Siedlce. 1740. Ḥayyim Abulafia, of Smyrna. 1747. Abraham Gershon Kutewer (of Kuty), brother-in-law of Israel BeSHT. 1753. Aryeh Judah Meisel of Opatow. 1758. Joseph Sofer of Brody (author of "Iggeret Yosef," a journal of his travels, Frankfort-on-the-Oder, 1761). 1765. Simḥah b. Joshua (author of "Sippure Ereẓ ha-Galil"). 1765. Moses ha-Yerushalmi (author of "Yede Mosheh," description of sacred graves). 1768. Pereẓ b. Moses (author of "Shebaḥ u-Tehillah le-Ereẓ Yisrael," Amsterdam, 1769). 1777. Israel Politzki, Menahem Mendel of Vitebsk, and Abraham Kalisker (Luncz, "Jerusalem." v. 164-174). 1799. Naḥman Bratzlav of Horodok, a Ḥasid (author of "Maggid Siḥot," a description of his journey to Palestine). 1805. Menahem Mendel and Israel of Shklov (disciples of Elijah of Wilna). 1833. Joseph Schwarz (author of "Tebu'ot ha-Areẓ"). 1837. Menahem Mendel b. Aaron of Kamenec (author of "'Aliyyat ha-Areẓ," Wilna, 1839). 1854. Albert Cohn of Paris. 1856. L. A. Frankl (author of "Nach Jerusalem"). 1867. Charles Netter of Paris. For a list of sacred tombs see Tombs; see also Travelers in Palestine. Pilgrimages are made usually on fixed days in the year, called by the Oriental and North-African Jews "days of zi'arah"; on such days it is customary to visit the tombs or relics of certain personages who in early or medieval times were famous as kings or prophets or for their holy lives. There are other holy places which the people honor as they will and at any time. The days of pilgrimage are celebrated by prayers, rejoicings, and popular festivals. In Jerusalem a crowd of Jews gathers before the western wall of the Temple of Solomon ("Kotel Ma'arabi") every Friday evening and on the eves of feast-days, as well as on twenty-three successive days from the eve of the 17th of Tammuz to the 9th of Ab inclusive. On the latter date this religious service occurs at midnight. On the 6th of Siwan, the Day of Pentecost, the Sephardic Jews go to pray at the tombs of the kings of Judah at the foot of Mount Zion. On the following day they pray at the tomb of the high priest Simon the Just, and at the tombs of other holy men in the neighborhood, while the Ashkenazim gather at the tombs of the kings of Judah. On the 18th of Iyyar, called "Lag be-'Omer," all the Jews of Jerusalem, Sephardim and Ashkenazim, pray at the tomb of Simon the Just. At Burak, between Jerusalem and Bethlehem, is the tomb of Rachel, wife of the patriarch Jacob, to which the Jews of Jerusalem go by turns during the thirty days of the month of Elul. But the 15th of Ḥeshwan is especially consecrated to this pilgrimage (Benjamin II., "Mas'e Yisrael," pp. 3-6, Lyck, 1859). At Rama, near Jerusalem, known in Arabic as "Nabi Samwil," all the Jews of the latter city gather on the 28th of Iyyar at the tomb of the prophet Samuel. The pious even pass the night there. At Khaifa, a port of Palestine, on the evening of the Sabbath which follows the anniversary of the destruction of the Temple, the Jews hold a popular festival, with illuminations, in a grotto, situated on the summit of Mount Carmel, in which the prophet Elijah is said to have taken refuge from the persecution of King Ahab. At Tiberias on the night of the 14th of Iyyar, known as "Pesaḥ Sheni" (Num. ix. 9-14), Jews gather from all parts of Palestine, and there are brilliant illuminations and a popular festival at the tomb of Rabbi Meïr ("Ba'al ha-Nes" = "the miracle-worker"). At Safed, from the morning after Passover (22d of Nisan) till the 18th of Iyyar, every week the Jewish population ceases to work, and makes pilgrimages to the suburbs in the following order; namely, to (1) Biria, where is the tomb of Benaiah ben Jehoiada, David's general; (2) the tomb of the prophet Hosea in the cemetery; and (3) 'Ain Zaitun, to the tomb of Joseph Saragossi, a Spanish immigrant who reorganized the community of Safed in 1492. On the night of Lag be-'Omer all the able-bodied Jews of Safed and several thousands of pilgrims from Palestine, Turkey, northern Africa, the Caucasus, and Persia celebrate a great popular festival with illuminations at Meron, near Safed, at the mausoleum of Simeon ben Yoḥai. At each new moon it is considered essential among the Ashkenazim of Safed—men, women, and children—to make a pilgrimage to the tomb of Isaac Luria, the famous cabalist. At Sidon, toward the end of Iyyar, people from the most distant parts of Palestine make a pilgrimage to the tomb of Zebulun, one of the sons of the patriarch Jacob. Places of pilgrimage exist not only in Palestine, but also in Mesopotamia, Kurdistan, Egypt, Algeria,and Morocco. In Mesopotamia the places of pilgrimage are Bagdad, Kiffel, and Bassora. At Bagdad, at the very gates of the town, is the mausoleum of the high priest Joshua, known under the popular name of the "Kohen Mausoleum." At each new moon it is visited by thousands of Jews and especially by barren women. In the local cemetery the tomb of the sheik Isaac, a revered Jew, is also an object of frequent pilgrimages. At Kefil, a locality in Irak near the ruins of Babylon, is the tomb of the prophet Ezekiel, to which the Jews of Mesopotamia go on pilgrimage on the 6th of Siwan (Pentecost). At Bassora the tomb of Ezra is visited on the same date. In Kurdistan the Jews have three places of pilgrimage: (1) In the district of Elkosh, near Mosul, the tomb of the prophet Nahum is a place of pilgrimage for fourteen days, the eight days preceding and the six following Pentecost. Readings are given from the prophecy of Nahum from a manuscript supposed to have been written by the prophet himself. (2) At Kerkuk, between the upper and lower parts of the town, are four tombs, said to be those of Daniel, Hananiah, Mishael, and Azariah, to which the Jews of the district make pilgrimages at Pentecost. (3) In the locality of Bar-Tanura, thirty hours distant from Mosul, is a grotto in which the prophet Elijah is said to have taken refuge. Several times a year the Jews of this region go thither on pilgrimage and contribute to the maintenance of the grotto. 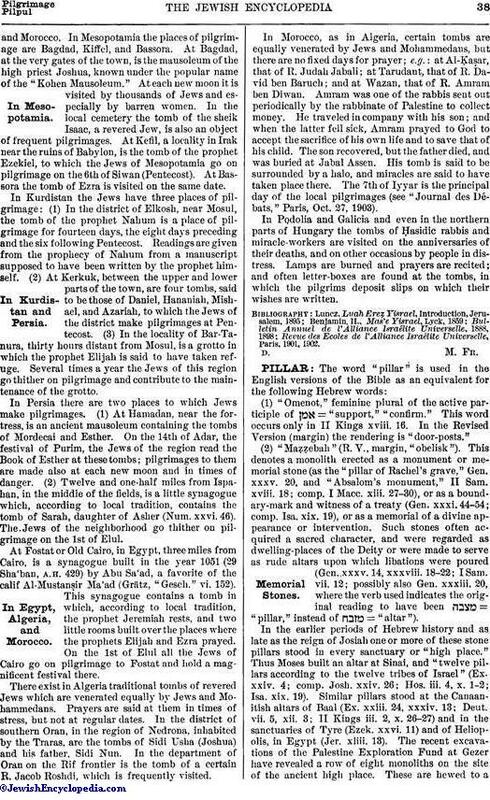 In Persia there are two places to which Jews make pilgrimages. (1) At Hamadan, near the fortress, is an ancient mausoleum containing the tombs of Mordecai and Esther. On the 14th of Adar, the festival of Purim, the Jews of the region read the Book of Esther at these tombs; pilgrimages to them are made also at each new moon and in times of danger. (2) Twelve and one-half miles from Ispahan, in the middle of the fields, is a little synagogue which, according to local tradition, contains the tomb of Sarah, daughter of Asher (Num. xxvi. 46). The Jews of the neighborhood go thither on pilgrimage on the 1st of Elul. At Fostat or Old Cairo, in Egypt, three miles from Cairo, is a synagogue built in the year 1051 (29 Sha'ban, A.H. 429) by Abu Sa'ad, a favorite of the calif Al-Mustanṣir Ma'ad (Grätz, "Gesch." vi. 152). This synagogue contains a tomb in which, according to local tradition, the prophet Jeremiah rests, and two little rooms built over the places where the prophets Elijah and Ezra prayed. On the 1st of Elul all the Jews of Cairo go on pilgrimage to Fostat and hold a magnificent festival there. There exist in Algeria traditional tombs of revered Jews which are venerated equally by Jews and Mohammedans. Prayers are said at them in times of stress, but not at regular dates. In the district of southern Oran, in the region of Nedrona, inhabited by the Traras, are the tombs of Sidi Usha (Joshua) and his father, Sidi Nun. In the department of Oran on the Rif frontier is the tomb of a certain R. Jacob Roshdi, which is frequently visited. In Morocco, as in Algeria, certain tombs are equally venerated by Jews and Mohammedans, but there are no fixed days for prayer; e.g. : at Al-Ḳaṣar, that of R. Judah Jabali; at Tarudaut, that of R. David ben Baruch; and at Wazan, that of R. Amram ben Diwan. Amram was one of the rabbis sent out periodically by the rabbinate of Palestine to collect money. He traveled in company with his son; and when the latter fell sick, Amram prayed to God to accept the sacrifice of his own life and to save that of his child. The son recovered, but the father died, and was buried at Jabal Assen. His tomb is said to be surrounded by a halo, and miracles are said to have taken place there. The 7th of Iyyar is the principal day of the local pilgrimages (see "Journal des Débats," Paris, Oct. 27, 1903). In Podolia and Galicia and even in the northern parts of Hungary the tombs of Ḥasidic rabbis and miracle-workers are visited on the anniversaries of their deaths, and on other occasions by people in distress. Lamps are burned and prayers are recited; and often letter-boxes are found at the tombs, in which the pilgrims deposit slips on which their wishes are written. Revue des Ecoles de l'Alliance Israélite Universelle, Paris, 1901, 1902.